Several Maker Faire Rome panel sessions dealt with "biology 2.0", a new term created to describe biology as the next field of research to be contaminated by Makers' hacking approach. Digital fabrication has been applied mainly to conventional prodution processes and inorganic materials: what will happen extending it to biology? A lot of exciting stuff, we think, but for obvious reasons this new development will take its time. But this doesn't mean that no one is experimenting a mix of biology, creativity and do-it-yourself hardware. 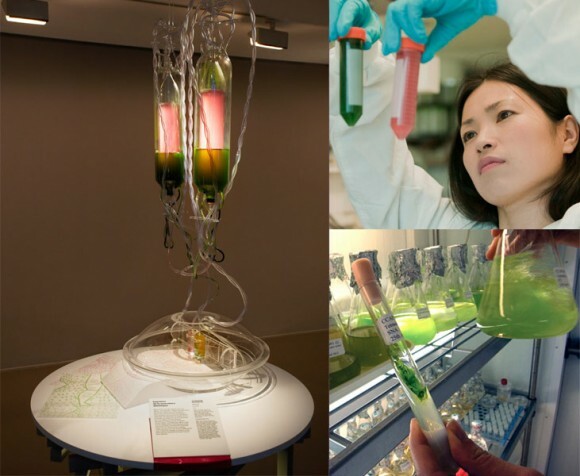 Meet japanese designer-biochemist Marin Sawa and her Algaerium Bioprinter, a prototype of 3D printer using different microalgae (Chlorella, Spirulina…) as coloured inks. In its first installations, the Bioprinter printed microalgae to create a new kind of experimental textiles, but the project's scope is much wider and with a broader impact on everyday's life. Working with Imperial College London, Marin Sawa wants to develop a new low cost algae-printing technology suitable for domestic use. In the future, we will be able to print algae directly at our home, to literally "build" health food supplements. Microalgae are in fact "superfood" because they are full of vitamins, minerals and nutrients. On a bigger scale, Marin Sawa describes an immediate future in which devices like the Algaerium Bioprinter will foster a new form of urban agriculture. Microalgae will be "farmed" in our cities and printed on demand to increase food safety.